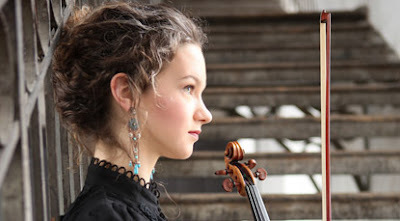 No season in Washington seems to go by without an appearance by violinist Hilary Hahn. She is a perennial favorite with area orchestras, and Washington Performing Arts presents her frequently in recital. It was not clear whether the empty parts of the Music Center at Strathmore, where WPA presented her on Tuesday night, were due to audience fatigue with Hahn or to an ongoing trend of declining audiences for the presenter. There was nothing on the program that could be construed as ear candy for audiences: relatively obscure sonatas by Mozart and Copland, interspersed with half of a set of six new partitas by Spanish composer Antón García Abril (b. 1933). Abril was one of the composers commissioned by Hahn for her ill-fated — but Grammy award-winning — Encores project, and Washington Performing Arts ponied up the money to commission this further set of pieces from him for Hahn to play. (She will play the other three partitas in the set, again presented by WPA, on October 28, 2016.) The title of Partita is somewhat misleading, implying a set of dance movements, as in Bach's set of three. What Abril has created struck me more as fantasias, as each one consists of sections in various moods and characters; perhaps we are meant to understand an earlier meaning of the word partita, before it became associated with dance movements. Abril emphasized double-stops in all three of the pieces heard in this concert, although he did not use them in the truly polyphonic way Bach did most memorably. For example, the meandering melody of the first partita had occasional double-stops providing a short of homophonic accompaniment, and in another section drones accompanied the tune. After a series of mostly unrelated sections, the first partita just faded away on a passage of repeating sixteenth notes. The second partita was more tart in harmonic flavor, with biting rhythms, and lasted only about half as long as the first one, not adding up to much. The third partita seemed closer in character to the first, with more introspective melodies and not all that polyphonic double-stops, leaving the impression of a set of possibly pretty but rather boring pieces. The less said about the composer's embarrassing, puerile program idea ("H-I-L-A-R-Y is for heart, immensity, love, art, reflexive, you," supposedly describing the six pieces), the better. This is one of those programmatic ideas that the composer, as Mahler did with some of his symphonic programs, should perhaps have kept to himself. The Mozart sonata (G major, K. 379) was a showpiece for Hahn's partner at the keyboard, Cory Smythe, who had the most challenging music of the evening. He went for a super-delicate sound, so delicate that some of the filigree-thin notes did not really sound clearly. It is a fairly mediocre piece, and the response of both performers, to give it a more Romantic swooning sensibility, had mixed success. Copland's elegiac violin sonata, last heard live from James Ehnes, brought out the best of Hahn's tone, as she played it with an airy simplicity. Here at last, in the faster movements, was some of the dance that seemed lacking in the Abril pieces.